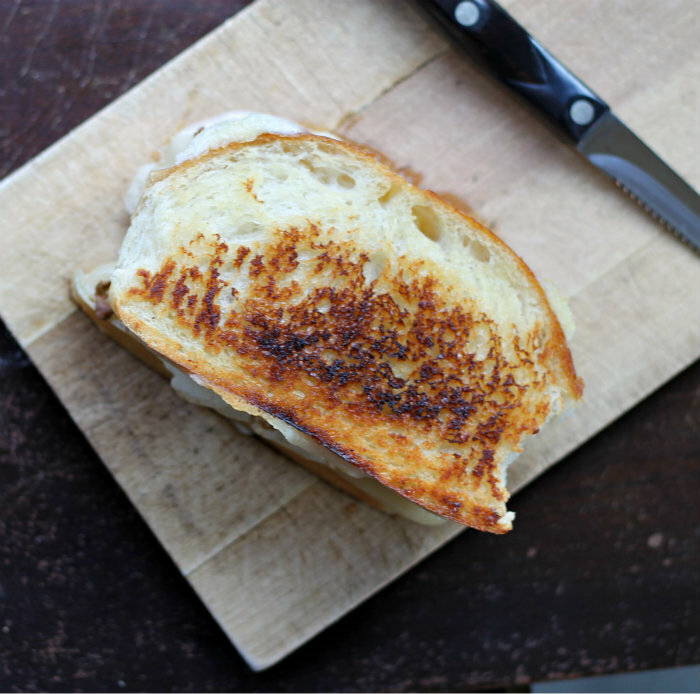 April is Grilled Cheese Month… here is a great way to celebrate Grilled Cheese Month. It has been a long week, so this post will be a short and to the point post. I have noticed around the web all the grilled cheese this month. Then I found out that it is Grilled Cheese Month. Little did I know last month that when I made my grilled cheese with caramelized mushrooms and onions that I was a month ahead of time. Since I love my breakfast foods and grilled cheese I decided to combine these two loves and come up with one yummy sandwich. 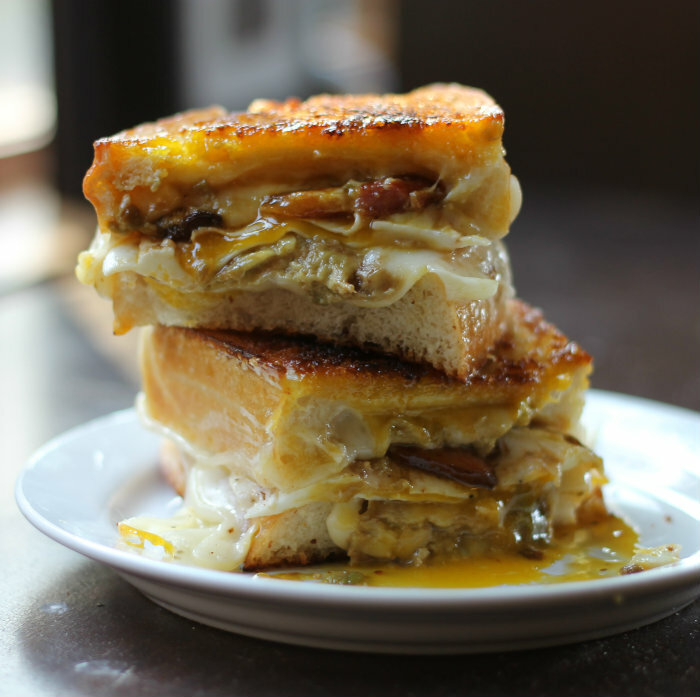 This is a grilled cheese with Swiss Cheese, avocado, bacon, and a fried egg for a sandwich that is perfect to start your day or for a fast meal in the evening. I prepared the egg over easy, because I love the runny yolk. So the sandwich was a bit messy, but boy was it worth it. Butter the outside of each slice of bread. Heat a skillet over medium heat. Place the slices of bread butter side down in the skillet. 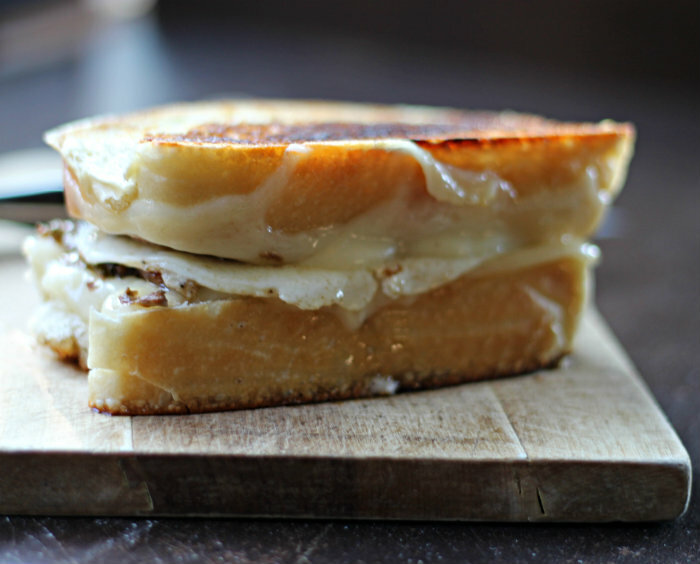 Place one to two slices of cheese on both slices of bread. Cover with a lid and let cheese melt and the bread toast. In another skillet fry the bacon until crisp.Once the bacon is crisp remove from skillet to a plate that is covered with paper towels. Remove most of the bacon grease, leaving enough to cover the bottom of the skillet. Crack an egg into the skillet and cook over easy, salt and pepper to taste, remove from skillet. Once the cheese is melted and the bread is toasted assemble the sandwich. Mash the avocado and spread over the cheese. ON one slice of the bread place the bacon and then place the egg on the top of the avocado. Take the other slice of bread with the cheese and avocado and place it on top of the egg leaving the toasted side on the outside of the sandwich. Moan. I so want this…RIGHT NOW. OH my gosh this looks amazing!!! Yes, I will be making this!